A lot of us eat our lunches in front of a computer, and even more of us at least snack while we're typing away or browsing the internet. This can leave our keyboards covered in crumbs that are difficult to clean up, look bad and can even stop the keyboard working correctly. Wash those nasty viruses away! I've run standard keyboard through the dishwasher before. I've only done it 3-4 times, but it's always worked after drying for about a week. Only a week to dry Nes! 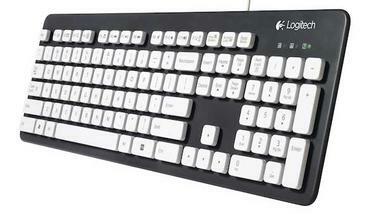 This is a glow-in-the-dark, spill proof keyboard. aliciarohail wrote: Just seeing if I can get rid of the bot's name, I've deleted the post but the name has remained for some reason. Yeah most keyboard can in fact be put in the washer. I had a customer of mine back when I was self employed to it. Told them to put it upside down and let it dry for 24 hours and had no problem. They were thrilled that I didn't cause them to have to gout and buy a new keyboard.